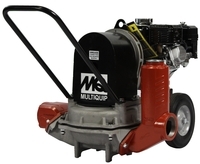 Portable Pumping Double Diaphragm Pumps are designed for heavy duty contractors’ use. The pump creates a positive vacuum and dry primes under most conditions. This pump ccan also run dry continuously without damage. 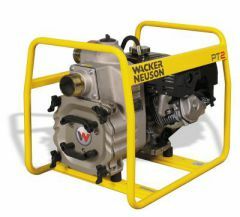 This pump is economical to operate and has excellent service life with minimum maintenance. 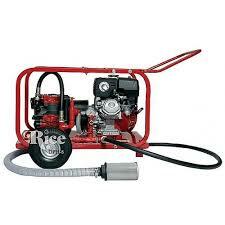 Hydrostatic Test Pump. The DPH-3B is a large volume medium pressure hydrostatic test pump. Designed to allow handling of up to a 10% chlorine solution, recommended for testing water lines up to 24″ in diameter. The Godwin Dri-Prime 6″ (150mm) CD150M with Bauer Quick-Disconnect suction and discharge hose automatic priming centrifugal pump is clearly the backbone of the temporary portable pumping industry. With solids-handling to 3″ (75mm) in diameter, maximum flows of 1700 GPM (385.9 m3/h) and 160′ (48.8 m) of total dynamic head, and indefinite dry-running capabilities, the CD150M can be found in a wide variety of applications from dewatering to sewage bypassing. Mounted on a highway trailer, the CD150M is the most maneuverable and versatile portable pumping system available, making it a favorite of contractors, municipalities, industry and environmental companies across the country. Fully automatic priming from dry to 28′ (8.5 m) of suction lift. Close coupled centrifugal pump with vacuum priming compressor mounted to a diesel engine. Also available in electric drive. Extensive application flexibility — will handle raw sewage, slurries and liquids with solids up to 3″ (75 mm) in diameter. Dry running, oil bath mechanical seal with abrasion-resistant solid silicon carbide faces. Continuously operated Godwin venturi air ejector priming device featuring belt-driven air compressor requiring no form of periodic adjustment or control. All cast iron construction with cast chromium steel impeller. Standard John Deere 4045D-T2, John Deere 4045T-T3, or Caterpillar 3054C-NA engine. Also available with a variety of other engines including Hatz, Perkins and Deutz. The Godwin Dri-Prime 4″ (100mm) CD100M automatic priming centrifugal pump is a highly maneuverable portable trash pump with flow capabilities to 750 gallons per minute (47 liters per second), total dynamic heads to 115 feet (35 meters) and solids handling to 2″ (50mm) in diameter. The unique Godwin venturi air evacuation system allows the CD100M to prime from dry conditions with suction lifts up to 28 feet (8.5 meters). Perfect in intermittent flow situations, the CD100M can run dry indefinitely without damage due to the oil bath mechanical seal design. For sewer bypass, general dewatering, and many other applications, the Godwin CD100M with 4″ (100mm) hoses is a powerful, yet versatile and portable pumping system. Close coupled centrifugal pump with vacuum priming compressor mounted to a diesel engine. Also available in electric drive or as bare shaft pumpend. Extensive application flexibility — will handle raw sewage, slurries and liquids with solids up to 2 inch (50mm) in diameter. Recessed impeller version available handling solids in excess of 2-3/16 inch (56mm) in diameter. Continuously operated “Godwin” air ejector priming device requiring no form of periodic adjustment or control. Dry running, high pressure oil bath mechanical seal with abrasion resistant solid Silicon Carbide interfaces. Solids handling ball type Non Return Valve with renewable flexible rubber seat and quick release access feature. Compact unit mounted on skid base or two wheeled highway trailer both incorporating integral overnight running fuel tank. Simple maintenance — normally limited to checking engine and seal cavity oil levels. Standard engine — Yanmar 3TNV88 or Caterpillar 3013C. Available with a variety of engines including Hatz, Perkins and Deutz. A variety of silenced sets are available.